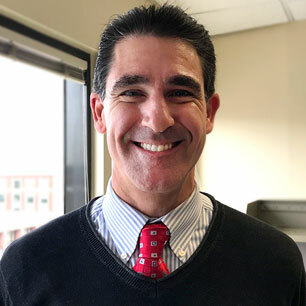 An alumnus of JWU, classes of 1988 and 1990, William Priante has served in a number of positions at Johnson & Wales University since first joining the Providence Campus staff in 1988 as a culinary teaching assistant. He moved on to the Career Development Office as director of food service and hospitality placement and then to Admissions as director of culinary admissions. In 1997 Priante left JWU to work for American Hospitality Concepts Inc., in Braintree, Mass., as manager of employee relations. In 1999 Priante rejoined JWU as director of operations on the opening team for the Denver Campus. Three years later he was named director of career development for that campus. In 2003 he left Denver to assume the position of director of international relations, at the Providence Campus. In 2005 Priante became director of domestic recruitment and training until 2009. From 2009 to 2017, as director of admissions for JWU Providence, Priante and his team of 45, was responsible for the enrollment of more than 2,800 domestic and international undergraduate and graduate students annually. Priante is a member of the Strategic Enrollment Team and the International Strategic Enrollment Team. He is also active with the JWU Global Citizens Program. He served for the past 12 years as the coordinator for Collegiate DECA’s Culinary Management Institute. He is a member of the National Association of College Admissions Counselors and serves as a board member for Junior Achievement of Rhode Island.